Living Digitally | Christian Cantrell is a science fiction author and Senior Experience Development Manager at Adobe. The Adobe Design team builds and prototypes software for all relevant platforms: Mac, Windows, iOS, Android, and the web. A twenty-year career in the software industry has taught me that designing and building software that feels native to its intended platform requires an intimate working knowledge of that platform. That’s why I put a tremendous amount of effort into being equally fluent in every operating system and environment we support. Switching back and forth between Mac and Windows is challenging; having both an iPhone and an Android device not just available for testing, but fully configured, functional, and ready to go, probably qualifies as arduous. But it can be done, and the secret is Project Fi. Using a Project Fi data SIM card in an iPhone doesn’t make it a fully functional phone, but it gets it very close. You won’t have voice capabilities, but if you install Hangouts, and if you enable incoming phone calls, you can make and receive calls to and from your Project Fi number though Hangouts over LTE. You can even use Apple’s Messages app at the same time to stay in touch with all your Apple-loyal friends and family (though you won’t be able to use it to send and receive SMS messages; that all happens through Hangouts). Short of moving your SIM card back and forth between phones, I’m pretty sure this is the best way to have two functional phones that use the same phone number. Additionally, it has the benefit of allowing you to send and receive texts from the desktop — on Mac, Windows, and Linux — though Hangouts in the browser. If your job requires you to remain platform agnostic — or if you’re just naturally multi-platform-curious like I am — Project Fi is the only way to go. A piece of equipment for adapting a tool or machine to a special purpose. An instrument or device designed for a particular use or function. An implement, an instrument or apparatus designed (or at least used) as a means to a specific end (often specified). In terms of hardware, the iPhone is nearly perfect. But iOS makes it feel more like an Apple appliance than a flexible and versatile computer. I started exploring primitive augmented reality with Google Glass about four years ago. A year later, I began playing with virtual reality using Google Cardboard. And the following year, after watching the Oculus Interstellar Experience at the Air and Space museum (twice — I went back the next day), I ordered the Oculus Developer Kit 2, built a VR-optimized computer, and subsequently spent hours exploring virtual worlds. It all felt very experimental and forward-looking back then. By the time I finally got the Oculus Rift CV1 (Consumer Version), I had already decided that VR wasn’t quite ready, and that it would be another generation or two before it would really inspire both consumers and content creators. But then something happened that completely shifted my perspective: I picked up the Rift Touch Controllers. Bringing my hands into VR with me raised the level of immersion to an entirely new level. The experience went from passive observation and consumption to active participation and creation. Suddenly, I was simultaneously controlling time while shattering enemies, climbing breathtaking mountains, and sculpting with light under the stars. Everything about VR I’d been complaining about was easily forgotten, and I was transported. I became convinced — not gradually, but almost instantly — that VR had the potential to become a computing platform every bit a transformative as mobile, if not moreso. As recent as a year ago, I would have said that tropes like Tony Stark manipulating holographic, virtual objects in 3D space, or the Avatar / Hunger Games / Westworld control rooms, were, at best, aspirational — vaguely feasible permutations of humanity’s non-foreseeable future. Today, I know for a fact that they’re not only achievable, but achievable on a reasonable timescale. VR still isn’t “ready” yet in the way that mobile was ready in 2007 when Apple introduced the iPhone. VR hardware is expensive, uncomfortable (though it’s gotten much better), and the experience is inherently solitary (at least in physical space). In general, getting in and out of VR is still too big of a commitment for most people to do on a regular basis. But as I wrote in a recent piece on Medium, if we wait for VR to be ready, we will have waited too long. If you’ve ever spent time in front of an Apple Thunderbolt display, then you probably know how tempting it is to rest your phone on the stand. And if you’re paying attention to iPhone rumors, then you know that the next iPhone will likely support wireless (inductive) charging. So why wouldn’t Apple capitalize on their customers’ habits by making a new 5K monitor with wireless charging built into the base? I know the rumor is that Apple is out of the monitor business, but I don’t buy it. First of all, I can’t imagine Apple being content with allowing customers to spend all day every day staring at a logo that isn’t an Apple. And second, as evidenced by LG’s recent technical problems with their 5K monitors, I also can’t imagine Apple permanently handing over such an important part of the customer experience to third parties who might not execute as well as Apple. I strongly believe that Apple’s partnership with LG is a stopgap measure — a way to cobble together a reasonable but temporary 5K solution to support the launch of the new MacBook Pro. But once the new iPhones are ready to be announced, I think we will discover that Apple has been working on both brand new 5K monitors, and brand new iMacs, in tandem. Apple’s new 5K monitors won’t necessarily be about directly generating huge profits for the company. Rather, they will be about contributing to the Apple ecosystem — or to borrow a metaphor from Amazon, adding energy to the Apple flywheel. Just like iPhone customers can augment their overall Apple experience by wearing an Apple Watch, and just like Apple Watches can augment the Mac experience by unlocking computers, and just like Continuity augments the experience of using an iPhone and a Mac together, customers will be able to augment both their MacBook and their iPhone experiences by using a single USB Type-C cable to connect a beautiful, extremely bright, wide-color 5K monitor, and to wirelessly charge their new iPhones at the same time. When trying to peer into Apple’s future from the outside, it’s important to note that they are in the business of inventing the future. That doesn’t mean inventing disparate devices; it means inventing constellations of devices, and connecting all those dots through seamless, wireless services. When Apple removed the headphone jack from the iPhone 7, they didn’t leave it up to third parties to provide bluetooth audio solutions. They did it themselves with both AirPods and with new Beats products to make sure it was done right (they even augmented bluetooth technology with their own W1 chip). And now that Apple has removed almost all the ports from their MacBooks, I can’t imagine they’re going to leave it entirely up to third parties to build out the USB Type-C ecosystem. When it comes to the experiences that really matter (like your Mac’s primary visual interface), Apple will take it upon themselves to do it right. 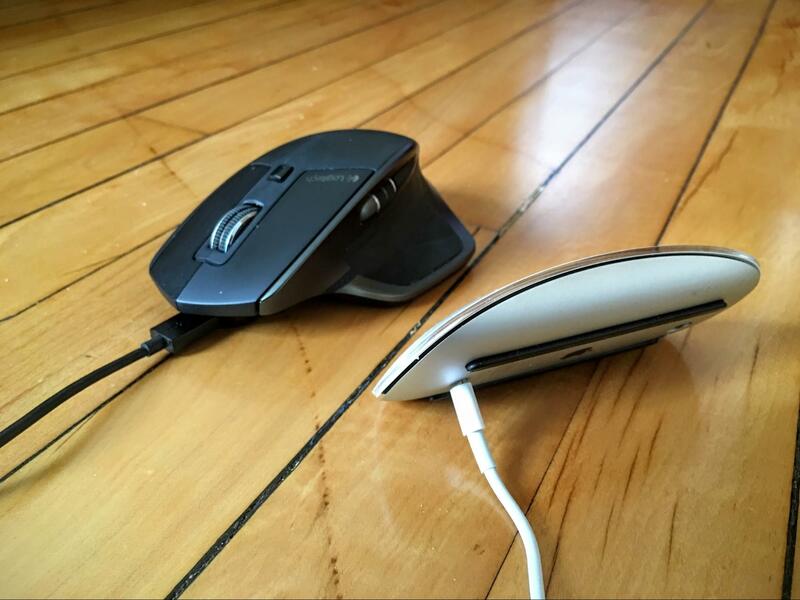 Other Apple peripherals (mouse, trackpad, keyboard, standalone Touch Bar) will eventually be wirelessly charged, as well. You’ll be able to charge the Apple Watch (along with your peripherals) on your monitor stand. And the big one: the next iPhone won’t be called the iPhone 8. I think Apple is going to reset the version number by calling the next new phone they release the Apple Phone. Now that I’ve had some success with Dracula orchids, I’ve decided to take on a new challenge. In fact, this might actually be the challenge when it comes to orchid growing: Dendrophylax lindenii, better known as the ghost orchid. Ghosts only grow in humid, swampy forests in Florida, Cuba, and the Bahamas, and are classified as endangered. In fact, there are only about 2,000 left in all of Florida, and the locations of most of the best specimens are kept secret in an attempt to prevent poaching. Very high humidity (I’m trying an average of about 80%). That’s a little lower than Dracula orchids, but still much higher than what most orchids require. Warm temperatures during the day with a 10-15 degree decrease at night. Very bright light (at least 3,000 foot-candles). Rather than leaves, ghosts photosynthesize through their roots, so they thrive in relatively bright environments. A mount they can attach themselves to, and that will not decay significantly over time since it isn’t possible to transfer ghosts to new mounts once established. What I find most challenging about ghosts is their limited palette for expression. Becoming a good grower of orchids (or any other type of plant) means observing tiny changes in behavior, sometimes over long periods of time, as expressed primarily through leaves, roots, stems, and blooms. However, ghost orchid seedlings have tiny roots, no leaves, obviously no blooms, and a dramatically reduced stem. And if that’s not challenging enough, they’re naturally very slow-glowing. That means by the time you’re able to observe a problem, it might very well be too late to correct for it. I got my first ghost at the beginning of the year, and I’d classify it as “stable” (certainly healthy, but barely growing). I used to have two, but the second one I ordered was damaged in transit when it was delayed due to a snow storm and exposed to freezing temperatures for too long (they should be shipped with a chemical heat pack during the winter; this one was not). Now the trick will be to make small adjustments in light, humidity, temperature, fertilizer, etc. until I see it start to thrive. Many updates to come (hopefully). Now that there’s also an NPR One API, I might just add some hooks into it one of these days, as well. My own little high-altitude, South American cloud forest. My first Dracula orchid bloom. Extremely high relative humidity (at least 90%). Warm temperatures during the day (in the 70s or 80s), and cold temperatures at night (in the 50s). “Full shade” which means a fair amount of light (1,000 – 1,5000 foot-candles), but not direct sunlight. If those weren’t challenging enough conditions, half my collection blooms from below rather than above which means they need to be potted in baskets and suspended rather than arranged on a shelf. In other words, these are some of the most difficult orchids to grow in completely artificial, indoor conditions. (I actually have a couple of orchids that are proving even more difficult, but I’ll save those for another post). Once I feel I have the process of growing Dracula orchids in a terrarium perfected, I’ll write a detailed article accompanied by a video. But for now, I want to report that I am having some very solid success. Not only am I seeing new growth with all my Dracula orchids, but my Dracula olmosii just bloomed. I’m particularly proud of the olmosii because it was nearly dead when I got it, having spent several months in a greenhouse that was far too hot. I think it’s really interesting that the orchid that was in the worst condition when I got it was also the first to bloom. Peek inside the bloom of a Dracula olmosii orchid and you’ll find a little face peeking back out at you.